Download the report as a pdf-file here, or click at the titles below. The Group also launched a number of new focus areas in 2018. In partnership with content providers, fibre-optic networks were installed in large parts of Narvik. Focusing on infrastructure and the establishment of solid framework conditions, work also started locally to survey and prepare sites for power-intensive business activities such as data processing centers. Nordkraft is a vertically integrated power company with core business in development, production, distribution and power sales. The group’s operations are mainly in Northern Norway, but the group also operates hydro power plants in Trøndelag and in western Norway. The company’s head office is located in Narvik. Nordkraft AS is owned by Narvik municipality (50,01 %), Jämtkraft AB (28,0 %), Troms Kraft AS (5,33 %) and Hålogaland Kraft AS (16,66 %). Improved operation cannot be purchased directly. Sizing, standardization, simplification, scalability, operation and maintenance. High lending and crossing mortgages. Liquidity and optimization, structure, collateral, gearing and new investments. Critical mass on operational capabilities. Construction, partnership, station operator and standardization. Construction risk, selection, project management. But still missing business sense in some aspects..
Live according to our values, management models, One company – One culture. Nordkraft is responsible for the societal consequences that follow from the group’s business and aims to run the business in a sustainable and ethically responsible way. Human rights, labour rights, the external environment and anti-corruption are important, and our focus is on ensuring that projects have sound and good practices and that ethical and environmental requirements are imposed on our suppliers. Nordkraft has a long and good tradition as a social actor, and works hard to manage the mandate in a responsible and sustainable manner. In order to succeed, we work in a structured and systematic manner on corporate responsibility issues and integrate this work in relevant processes in the company, such as project development and operation of our assets. Corporate responsibility is an integrated part of Nordkraft’s management system, Nordkraft Standard. The management system facilitates structured and coordinated handling of the company’s corporate responsibility, and the system is regularly evaluated to adapt it to new expectations and challenges. 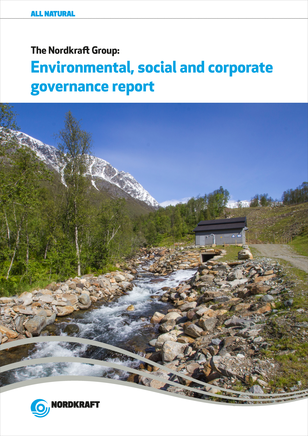 Descriptions on how Nordkraft safeguards our corporate responsibility for different areas can be found in governing documents. All notifications must be taken seriously. All notifications must be processed immediately. Anonymous notification will be processed. Anonymous sources may be as valuable as open sources. The processing of the notice is confidential. The notification system should be used without fear of consequences, or reprisals. The notifier shall receive feedback within a reasonable period of time that the conditions for the notification are processed in Nordkraft. The accused person is also entitled to protection when notified and until the case has been processed. Nordkraft works systematically with health, safety and environment to ensure a health-promoting workplace for all employees, and aims to create a developing and inclusive environment. Every day all Nordkraft employees should come home unharmed from work. Responsibility has a high priority, and Nordkraft has a 0-vision regarding injury or loss of people, environment and facilities. The strategy for achieving the goal of zero serious work-related injuries implies that proper attitudes and a good security culture are rooted in all aspects of the organization. Safety has the highest priority, and Nordkraft focuses on accident prevention and preventing personal injuries, as well as procedures for monitoring and reporting unwanted incidents. The knowledge from these incidents shall continually make us learn to further prevent accidents. Guidelines and principles are stated in their own HSE policy. Caring for the external environment is a natural part of Nordkraft’s social responsibility and is an important means of ensuring efficient resource utilization and good operation. Some of Nordkraft’s businesses are also subject to strict requirements for the external environment through laws and regulations, as well as through conditions related to received licenses. Hydroelectric power plants and wind farms produce environmentally friendly and renewable power, and it is in everyone’s interest that resources are exploited in the best possible way. development, operation and maintenance of hydro-power, grid operations and wind power. There is a focus on routines to prevent and minimize direct environmental damage. When planning new facilities, nature and environment are taken into account as far as possible, and according to structural regulations. Nordkraft AS focuses on equal opportunities for employment, competence development, advancement and other working conditions regardless of gender, age, ethnicity, philosophy of life and other factors that may seem discriminatory. Nordkraft has as its main goal to create the greatest possible shareholder values on behalf of its owners, but the means for achieving these goals must be exercised with the correct ethical standard for both the company and the individual. We do not give or receive bribes or other improper advantages, whether directly or indirectly, for business or private gain, whether for ourselves or for others. To ensure that this standard has the same content for the entire company and its employees, a policy has been developed for what this means to us.